Welcome to the five hundred and ninth of my blog interviews with novelists, poets, short story authors, biographers, agents, publishers and more. Today’s is with non-fiction, poet and short story author Bob Feller. A list of interviewees (blogged and scheduled) can be found here. If you like what you read, please do go and investigate further. Morgen: Hello, Bob. Please tell us something about yourself, where you’re based, and how you came to be a writer. Bob: I was born in a small northern Wisconsin town of about 9,000, where my father and uncle introduced me to the outdoors, specifically hunting and fishing. The writing came as a side interest due to my passion for literature – I am a retired English teacher. I now reside in an average-sized town on the shores of Lake Michigan, Manitowoc, Wisconsin, with my wife, Ellen, and two daughters, Lauren and Haley. Morgen: It must help (with grammar at least) having that background. What genre do you generally write and have you considered other genres? Bob: Thus far, I have written mostly nonfiction, outdoor sporting topics. I have dabbled in some poetry and short story fiction, again mostly relating to the outdoors, family, pets, or other influences in my life. Morgen: 🙂 In my bio I say I dabble with poetry (but don’t “get it”). What have you had published to-date? 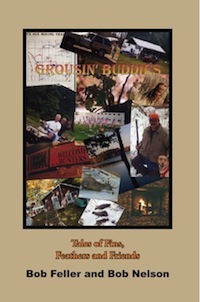 Bob: My hunting partner, Bob Nelson, and I have published one book, Grousin’ Buddies – Tales of Fins, Feathers, and Friends in 2005. I have had stories published in Ruffed Grouse Society Magazine and one story in Upland Almanac. Bob: To be honest, I have not submitted much, so the rejection issue has not come up. I did enter a few contests. One in particular sent back an evaluation of my story. I had to eat a little humble pie, but I found the information helpful. Morgen: It’s great when you get feedback, as long as it’s constructive, although it’s usually just one person’s opinion so you can disagree (unless they’re right). Do you have an agent? Do you think they’re vital to an author’s success? Bob: I do not have an agent. I self-published through Authorhouse. With the electronic and indie publishing resources available today, I’m not certain an agent is necessary for all authors. I suppose it depends on one’s goals, preferred genre and niche. Morgen: I’d say so too. Are your books available as eBooks? Were you involved in that process at all? Do you read eBooks or is it paper all the way? Bob: Initially our book was in paperback form only, but it is now available on Kindle, Nook, Sony, and Books on Board. Authorhouse did it all for me. I am cautiously approaching the world of eBooks and do intend to publish a sequel to Grousin’ Buddies in that format. However, I am “old school” when it comes to reading. I still like the feel of hard copy in hand. If I had a Kindle or Nook, I would probably reconsider that position. My daughter’s nose is eternally buried in her Kindle. Morgen: It’s great having the option, and uploading an eBook isn’t that hard, once you’ve done it once. Smashwords has a great style guide which, although 70+ pages, is very user-friendly. That format and Amazon are very similar (SW prefers the Garamond font whereas Amazon recommends a more standard, e.g. Arial or Times New Roman. Plus Amazon has a title page. But once you have the template it’s there for further works. I’ve just created a How to create an ebook page on this blog to show how straightforward (I won’t say “easy”) it is. How much of the marketing do you do for your published works or indeed for yourself as a ‘brand’? Bob: So far, most of the marketing has been done by me. I have done internet radio, a few book signings locally, some news releases, and getting stories in sporting magazines has helped. I wouldn’t refer to myself as a brand. Morgen: Invariably it’s the author’s name that people go buy (unless you write a ‘Harry Potter’) so you may become a brand without realising it. Do you have a favourite of your books or characters? If any of your books were made into films, who would you have as the leading actor/s? Bob: My, those are tall dreams. Since my writing has been short story, nonfiction for the most part, I haven’t even thought of something like film. I am working on a You Tube video promotion for our book. That’s as far as the film aspirations have gone. Morgen: You’re a step ahead of me; a book trailer is on my ‘to do’ list. Did you have any say in the title / covers of your books? How important do you think they are? Bob: My co-author and I had all the say. We made up the title and designed the cover. Actually, the writing (the stories and the experiences) drove the process for both. Bob: At the moment, Bob Nelson and I are completing another collection similar to our first book – sort of a sequel. This is the one I would like to publish as an eBook through Smashwords or a similar program. I have two stories about to appear in the RGS Magazine. There are a few projects in the hopper: a ‘how to’ about tennis camps and a World War Two piece based on letters my mother and aunt kept during that time period. Morgen: It sounds like my mother and aunt are of a similar (they’re 81-year-old twins) – I wonder who similar their letters would be to yours. Do you manage to write every day? Do you ever suffer from writer’s block? Bob: I do not write every day. I write when I’m moved to do so, which is often. I believe this helps with avoiding some of the writer’s block, but I honestly don’t know a writer who has entirely conquered that evil entity. Morgen: I do but only a short story (usually flash fiction) – having to post it on the blog at 5pm daily is a great motivation. Do you plot your stories or do you just get an idea and run with it? Bob: So far, I have been a “run with it” writer, but I have never been pressed with deadlines or demanding publicists and agents. I have run into a few brick walls, causing me to reflect and start over. I do value the plan backwards approach having been a classroom teacher for 36 years. I know it works and is the most efficient process, as long as one can keep it from interfering with creativity. Morgen: Do you have a method for creating your characters and what do you think makes them believable? Bob: Since I have just started to write a bit a fiction, my first taste of that process has remained simple. I base my characters on real people, mostly friends, acquaintances, and relatives (kind of like comedians gather their material). Morgen: I think that’s very wise, especially for longer pieces. You write non-fiction, do you write any poetry or short stories? Bob: All of the above, though I do lean more toward nonfiction. Bob: I do edit much, almost too much. It’s the teacher in me that keeps looking for errors and finding them. If I were pick up our first book and start reading one of my stories, I would inevitable find a phrase, some word choice, that I would now compose differently. Editing is truly never done; we just get to a point where enough is enough – print it! Morgen: We do. I go back to pieces for re-submission and can always tweak them. You do just have to let go when you can’t see anything else at the time. Do you have to do much research? Bob: So far my topics have been such that I did not require research. Some of the upcoming projects will need research, especially the World War Two piece. Morgen: At least there’ll be plenty of material online. What point of view do you find most to your liking: first person or third person? Have you ever tried second person? Bob: Our first book was predominantly first person, since it was rather memoir-like in style. I do like third person for fiction, but I have never approached second person point of view other than in character conversation. Morgen: It’s a hard pov to do and like Marmite; love it or hate it (I love second person but not so keen on Marmite!). Do you have pieces of work that you think will never see light of day? Bob: Yes – either because they aren’t good enough or are too personal. Morgen: I can relate to that although I’m hoping I have enough experience to be able to go back through the not good enoughs to do something with them. What’s your favourite / least favourite aspect of your writing life? Has anything surprised you? Bob: I like the catharsis writing offers. I don’t mind the hard work – good writing is hard work. However, the time, patience, and persistence needed to get published can be disheartening at times. Morgen: Can’t it just; time is definitely something I struggle with. What advice would you give aspiring writers? Bob: Write what you know and are passionate about. Write for the love of writing first, let the other reasons be always secondary. Bob: No takeaway containers – I’m a pretty good cook. I have a really good recipe for upland game birds. It’s slow cooked in wine and onions for three to four hours – melt in your mouth delicious! As for the three people: Jesus, Ben Franklin, and Amelia Earhart. That should make for some interesting conversation – think I could find a good story or two in there. Morgen: I wrote a story about Amelia Earhart in my Story a Day May 2011 collection. 🙂 Is there a word, phrase or quote you like? Bob: I have a long time friend who once said, “Life just keeps comin’ at ya.” So true. Morgen: It certainly does (thankfully in some respects :)). Are you involved in anything else writing-related other than actual writing or marketing of your writing? Bob: Not at the time, but there are options out there. With my English teaching background, editing services or reviews might be a future option. I have experience in public speaking and would be interested in being a presenter at seminars, workshops, etc. Morgen: I’ve been asked to be a speaker at a couple, one through an online contact, the other in person so it’s just making those contacts. What do you do when you’re not writing? Bob: I do coach tennis and run a tennis camp in the summer, but my true passion is the outdoors. I enjoy hunting and fishing immensely, not just for the taking of game, but to experience nature’s beauty and the camaraderie of sporting companions (that includes dogs). Morgen: Hence you writing what you know. Are there any writing-related websites and/or books that you find useful? Bob: The writing group that I am in through Linkedin (where I found you) has been very helpful. People are so willing to share. I also get an e-mail subscription to Writer’s Digest which often has insightful articles. I am exploring more blogs, such as yours. There are so many out there, and only some of them meet my needs. It’s a long sorting process. Morgen: LinkedIn’s great. I belong to about a dozen writing groups on it and have their weekly digests and often have something to add to the discussions going on. How valuable do you think forums or networking sites are to you as an author? Bob: The Linkedin site, Published Author’s Network, has been quite valuable. I have been exposed to a plethora of opportunities, such as this interview, that I would not have been able to find on my own. Morgen: Yes, sadly you wouldn’t have found me doing a Google search for ‘Author interviews’. Despite having over 500 in the ether, none of them are in the first 25 pages (that’s as far as I got when I looked although there were 626,000,000 results). What do you think the future holds for a writer? Bob: I think the future holds much. A story well told will always be a popular commodity. Authors will now find it easier to get their stories out to the public with all the new technology and self-publishing opportunities. Morgen: We do, isn’t it great. Where can we find out about you and your work? Bob: I do have a website: www.nelson-feller.com/Grousin–Buddies.html or you can find me on Facebook by searching for Feller / Grousin. I can also be found on paperdragonink.com and on the authors’ site through Amazon. If you visit my website, I have links to all of the other sites as well as an audio recording of my book interview with The Authors Show. Bob: I recently read a quote from an author who said something to the effect that every person’s life is interesting. We all have a story to tell. I would encourage more people to tell those stories. Morgen: Absolutely. I was worried when I started these interviews that by asking (generally) the same questions that they’d feel very samey but they’ve been surprisingly different to one another… I think that anyway, and I’ve read them all! 🙂 Is there anything you’d like to ask me? Bob: Yes, how do you do it? This blog alone must consume hours and hours of your day. When do you find time for you, to write and enjoy family and friends? Morgen: <laughs like a mad woman> I left my job mid-March this year and up to recently have been doing little else but the blog and blog-related emails which hasn’t earned any money (I have two lodgers instead) but my own writing was suffering so I started 5pm fiction slot at the beginning of June so I’d write a story a day (which I’d been doing since 1st May anyway for Story a Day) and I’m still going. Plus I have a publisher offer me a contract for one of my novels so I’ve been doing final edits and it should all be wrapped up by the end of this week. Needless to say I’ll be making a big announcement when it’s all official. 🙂 Thank you, Bob. “I’ve never seen anything like it,” Jim concluded. When Father Hoffman finished (administering last rites), Dad mumbled a “thank you” to the best of his abilities. “You’re welcome,” came Father’s gentle reply. With that, I suggested that Joyce and the others go home and get some rest. It was after 10:30 P.M. I would call Joyce if anything happened. I thanked them all for being there. Bob Feller, retired teacher, department chair, current tennis coach and camp director, was born and raised in a small-town America during the ’50s and ’60s. He truly lived “The Wonder Years” and “happy Days” experience. Graduating from U.W.-Superior in 1973, he took a counseling job in a residential treatment center before landing a teaching job in Manitowoc, Wisconsin. He remained there for 36 years of teaching and resides there still as a retiree with the “catch of his life”, Ellen, and daughters Lauren and Haley. His life-long friend, business partner, and hunting buddy co-authored a book, Grousin’ Buddies in 2005. When not writing or coaching, Bob enjoys the outdoors, spending a good deal of time on the trails and lakes of northern Wisconsin.